Don’t you love it when you accidentally discover a fantastic place for a delicious bite to eat? This recently happened to me at The Bridge Café in Frenchtown. 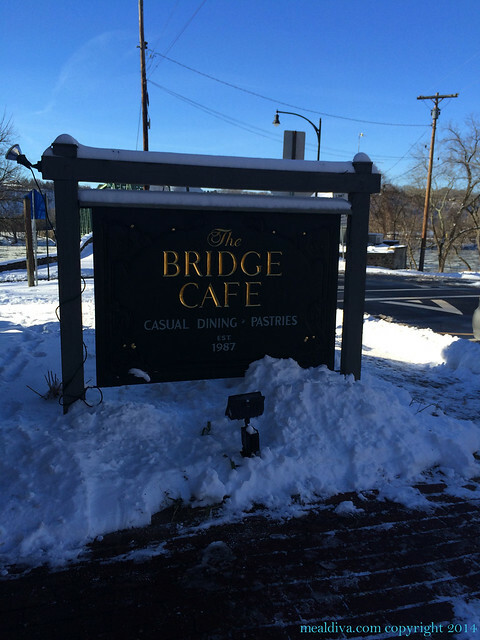 It was a cold day in February when my family and I stumbled into The Bridge Café for lunch. Located in Frenchtown’s original train depot, I was immediately impressed with the very playful and casual ambiance. The wait staff followed suit but was very nice and polite and immediately attentive and helpful when I told them about my daughter’s food allergies. To start, we ordered hot chocolate for the kids and coffee for the adults: I find it necessary to comment on the hot chocolate because it was a simply luxurious treat—with a wonderful, ultra-creamy and delicious texture—I almost stole it from my daughter. Yum! The coffee was also spectacular and the beans were from Small World Coffee which is roasted in Princeton. Can’t go wrong with New Jersey coffee! The menu was adorable with the catchy phrase “Eeeny meeny miney mo…” at the top. And it was hard to decide what to choose: from the Croque Madame to the grilled spinach cakes to the shrimp Greek platter—it all sounded delicious. After much pondering, I finally decided on the special, a spinach and feta quiche. 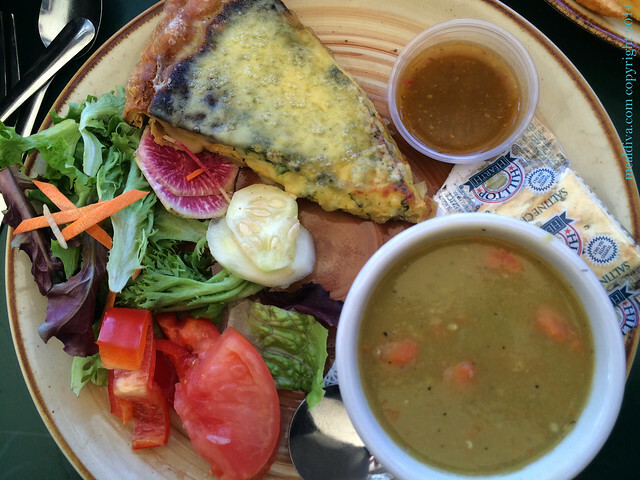 I definitely made the right decision as the warm and cheesy quiche was served on a colorful plate of salad with a small cup of tasty split pea soup. Meanwhile, my husband enjoyed a black angus “Bridge burger” on a toasted bun. Even in the dead of winter, the plates were alive with crunch and color. As we savored our lunches, we enjoyed the icy view of the bridge overlooking the Delaware River. On a sunny spring, summer or fall day, The Bridge Café must be packed with patrons eating fabulous food view a magnificent view. After enjoying a fresh and vibrant lunch, we turned our attention to the pastries—sweet tidings made from scratch that were absolutely mouthwatering—especially the doughnuts. We were entirely too full to try the ice cream but there were people ordering away—it must be excellent ice cream if it’s being ordered in the middle of winter! I highly recommend stopping at The Bridge Café for lunch. It is a great little place to enjoy freshly prepared food with a view of the water.